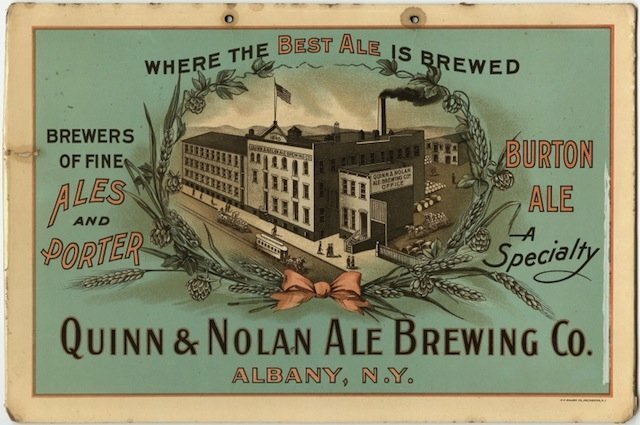 The Albany Institute of History &amp- Art will be hosting its second event featuring Hudson Valley Hops on Saturday, April 20, 2013 from 4-7pm. The following essay by Albany County Clerk Thomas Clingan is reprinted with permission from the Tivoli Times, the newsletter of the Albany County Hall of Records (ACHOR). ACHOR celebrated its 30th Anniversary in October. 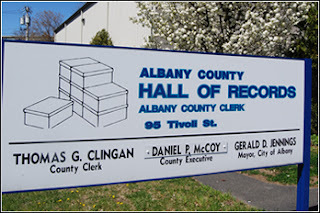 Albany County can trace its records management program to a 1978 National Historical Publications and Records Commission (“NHRPC”) grant of $9235 to inventory Albany County Clerk records, accepted by the Albany County Legislature in Resolution 99 of 1978. This first modern inventory was completed and printed in 1979. The theft and quick recovery of County Clerk’s oldest Dutch record book in May 1980 increased public awareness of the need to safeguard these documents, and in January 1981, Resolution 10 of that year accepted a further $20,000 NHPRC grant to study the possibility of a joint city and county archives and records management system. Beginning this month the Albany Institute of History &amp- Art will launch a new monthly lecture series entitled Making It American. The series will take a broad look at what art and material culture can teach us about the development of American history, culture, the arts, politics, and our identity as a nation. 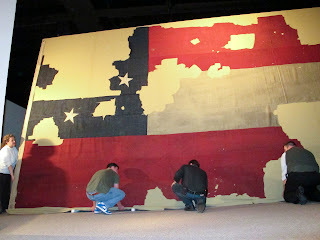 A massive, iconic Confederate flag, torn down by a Colonel Elmer Ellsworth, a soldier born in Saratoga County and widely remembered as the first Union officer killed in the Civil War, is now on display at the New York State Museum. 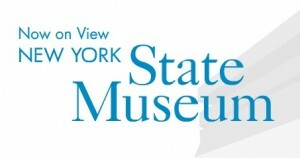 The Archives Partnership Trust and the New York State Archives have announced the availability of awards for applicants to pursue research using the New York State Archives. The Larry J. Hackman Research Residency program is intended to support product-related research in such areas as history, law, public policy, geography, and culture by covering research expenses. Award amounts range from $100 to $4,500. The deadline for receipt of application materials is January 15, 2013. Academic and public historians, graduate students, independent researchers and writers, and primary and secondary school teachers are encouraged to apply. Projects involving alternative uses of the State Archives, such as background research for multimedia projects, exhibits, documentary films, and historical novels, are eligible. The topic or area of study must draw, at least in part, on the holdings of the New York State Archives. 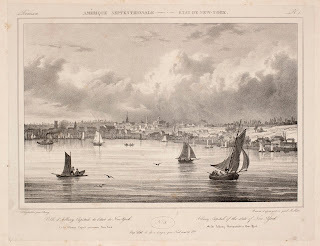 Information on the 2013 Larry J. Hackman Research Residency Program is available on-line at www.nysarchivestrust.org or by contacting the Archives Partnership Trust, Cultural Education Center, Suite 9C49, Albany, New York 12230- (518) 473-7091- hackmanres@mail.nysed.gov. Dr. Paul Huey, now retired as archeologist for the New York State Historic Sites system (Office of Parks, Recreation and Historic Preservation) who will present a talk on the history of Fort Orange and the excavation in 1970 and 1971 of archeological remains of the fort ahead of the construction of Interstate 787, an event which inspired a revival of interest in the history of Albany in the Dutch period. Fort Orange was a trading center built by the Dutch West India Company in 1624. The fort was located outside of Beverwijck (present-day Albany), to the south and near the river bank. In 1647, Petrus Stuyvesant, representing the West India Company as director of New Netherland, began to allow private traders to build houses inside the fort. 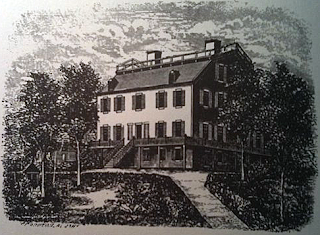 Other traders built houses close to and outside the fort, which Stuyvesant considered to be illegal. Consequently, Stuyvesant established the settlement of Beverwijck as a town at what he considered a satisfactory distance away from the fort. The fort and all of New Netherland were taken by the English in 1664 during peacetime. The fort was retaken briefly by the Dutch who then returned it to the English, and it was finally abandoned in 1676 by the English. The English then built a new fort on the State Street hill in Albany. 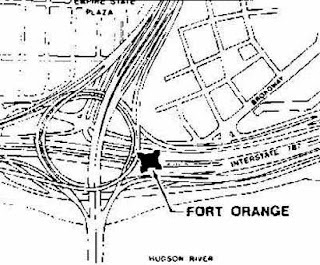 Illustration: Location of Fort Orange on today’s Albany’s riverfront from Len Tantillo’s Visions of New York State. Digital copy courtesy The People of Colonial Albany Project. During the Great Depression, President Franklin Delano Roosevelt promised a &#8220new deal for the American people,&#8221 initiating government programs to foster economic recovery. 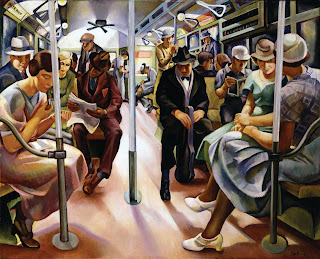 Roosevelt’s pledge to help &#8220the forgotten man&#8221 also embraced America’s artists. Albany County Hall of Records will celebrate its 30th anniversary on Wednesday, October 17, 2012 from 10AM-2PM. All interested chroniclers of history are invited to the open house at 95 Tivoli Street, Albany, New York.ВSpeakers will talk about the history of the Hall of Records, there will be exhibits on display, and tours of the facility will be available. Light refreshments will be included. The Hall of Records includes the County Archives, Micro-Imaging and Records Center and currently holds over 22000 thousand cubic feet of inactive records and 9000 cubic feet of archival records in its two locations. You can read their latest newsletter here.